Actor James Nesbitt has said he would love to appear in the second series of the ‘extraordinary’ comdedy Derry Girls. The Ulster University Chancellor was speaking to an audience of students from schools across Londonderry at an event at St Mary’s College this week. Addressing students, the Cold Feet and The Hobbit star said he had actually spoken with Derry Girls writer Lisa McGee about the possibility, and said the Channel 4 show has helped give the city a really cool identity. 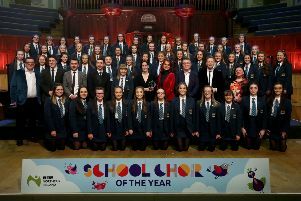 Earlier, in answer to a question from a pupil about what the city can do to capitalise on the success of the show, Mr Nesbitt said: “I know Lisa well and Derry Girls has had such an incredible impact. “It is subversive and it doing exactly what programmes should be doing for your age group. “Even people like me, I’m supposed to not be offended by anything, but even I’ll watch it and go, ‘Oh my God!’, which is exactly what it should be. I love the truth of it. Lisa is such a truthful writer; there are no lies in it,in a sense. “Of course, it’s a TV programme but they are not in any way trying to sanitise, or tone down the accent. In answer to the question, he added: “So how to capitalise on it - it gives an incredibly cool, brilliant identity, not that you needed it, but wherever you go now from this point on, you’ll be going to universities and work and people will know Derry Girls because of that programme. James Nesbitt and pupils from St Mary's College.